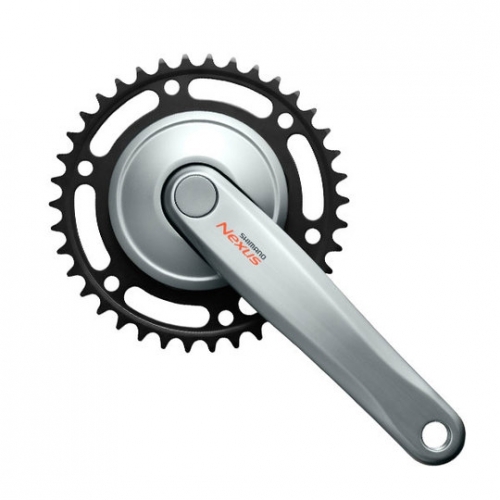 The Shimano Nexus chainsets are designed for everyday bicycles fitted with Shimano hub gears. They are also suitable for use with other hub gears and for single speed usage if the small number of teeth on the chainring is acceptable. These chainsets have 38 teeth, a long lasting steel chainring and an aluminium 170 mm crank. The enlarged centre fits the gap at the front of the Excelle, Mirada and Saber chaincases and it fits on a square bottom bracket such as that from Shimano. Supplied as a pair which includes a matching left-hand crank. In hilly areas, a 33 tooth chainring may be preferred. See our alternative Nexus compatible chainrings.